Thursday March 5 1908 It rained all day. I was busy sewing. I got my old white waist ready to make into a dressing sacque and did other work. Billy was away all day. Will about the place most of the day. It was seven years today since we buried Lee. What a day it was. Friday March 6 1908 I fixed a pillow case in the forenoon. baked bread today. I mended a lot of mittens for Will in afternoon. I read in the evening. There has been a strong wind all day. Will was down to Woolf in forenoon he is much better. 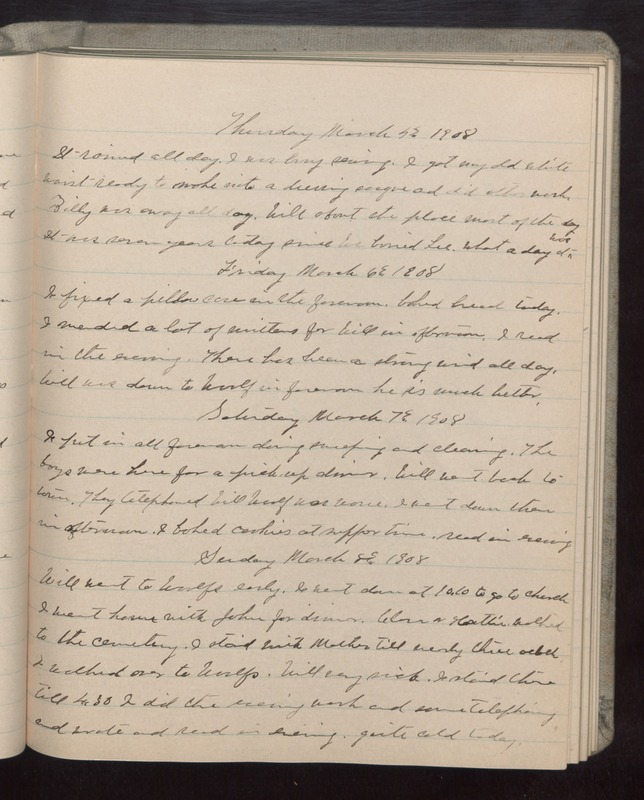 Saturday March 7 1908 I put in all forenoon doing sweeping and cleaning. The boys were here for a pick-up dinner. Will went back to town. They telephoned Will Woolf was worse. I went down there in afternoon. I baked cookies at supper time. read in evening Sunday March 8 1908 Will went to Woolfs early. I went down at 10.10 to go to church I went home with John for dinner. Clara & Hattie walked to the cemetery. I staid with Mother till nearly three oclock I walked over to Woolfs. Will very sick. I staid there till 4.30 I did the evening work and some telephoning and wrote and read in evening. quite cold today.